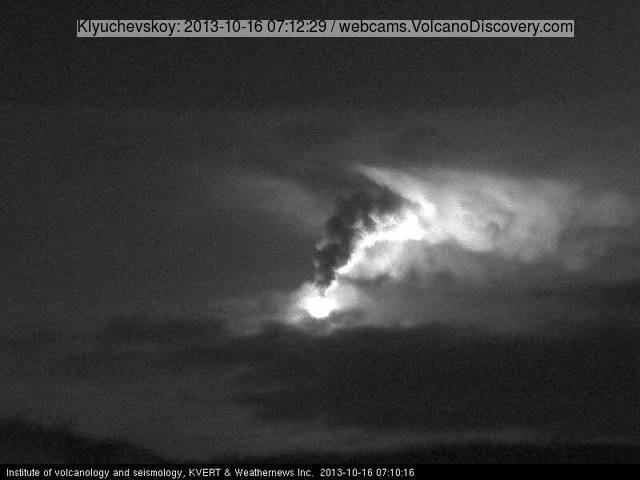 Klyuchevskoy (Kamchatka): Strong eruptive activity continues. VAAC Tokyo reports an ash plume rising to estimated 33,000 ft (10 km) altitude, i.e. about 5 km tall above the volcano, and drifting SW.
Aircraft should avoid the airspace near as well many miles southwest and east of the volcano. VAAC Tokyo publishes regular updates about the observed and predicted extent of the ash plume. Galeras (Colombia): Surface and seismic activity have been low recently. A 3.8 magnitude earthquake at 5.5 km depth and 7 km NE of the volcano occurred yesterday at 17:13 local time. The earthquake was felt in Pasto, and the municipalities of Nariño and La Florida. This event was preceded by 14 earthquakes of smaller magnitude (less than 2.6) recorded between 12:56 am and 16:40 pm, located as well on the NE sector of the volcano at depths 1.2 and 7 km. Cumbal (Colombia): Seismic unrest continues at low levels with little changes over the past weeks and months. GEOMINAS keeps the volcano at yellow alert level. Sotará (Colombia): Low-level seismic unrest continues with no significant changes to report over the past months. Sabancaya (Peru): Seismic unrest continued through Sep-Oct including occasional swarms of volcanic-tectonic quakes (such as on 10 Oct), but overall earthquake activity has been showing a slowly decreasing trend. The volcano remains to be closely monitored. Ubinas (Peru): Surface and seismic activity have calmed down recently and are near background levels. Barren Island (Indian Ocean): A new eruption occurred this week. This was confirmed by the Indian Navy (via twitter) who reported "smoke" and lava seen on the island from a surveillance plane. A large hot spot is visible on recent MODIS satellite data on the remote volcanic island, located in the Andaman Islands archipelago. No details about the nature of the eruption are available at the moment, but the description and distribution of the hot spots suggests that it might be an explosive-effusive eruption with lava flows (possibly reaching the sea. A satellite image from yesterday shows what likely is a steam/gas plume, but doesn't allow to recognize details.